Why in the world would you do business with an ASDA Dealer? Dr. Edward G. Porcher - a victim of "the end of the medical Middle Ages"
Hetty likes them that way: gilt-edged with stars! Ordinary looking cover…to the lady who “danced herself to death”? Does Your Chewing Gum Lose Its Flavor on the Bed Post Overnight? Over the past several years I have been forming a small collection of chewing gum manufacturers cancels on the black proprietary stamps of 1914. The six or seven page collection provides some insight into fiscal and social history and some of the excitement that awaits for the student who is willing to perfins as well. There even remain unanswered questions about the tax rates. Before launching into the cancels, let’s explore briefly the basics of the stamps themselves and the law that brought them into being. 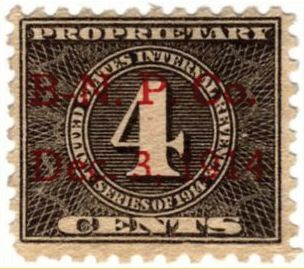 The Act of October 23, 1914 brought into being three sets of stamps for wine, proprietary articles, and for documents. The cents denominations were all printed by offset lithography, one of the Bureau of engraving and Printing’s early ventures away from intaglio printing from recess-engraved plates. Although the tax on wines was effective the next day, the tax on proprietary items was not effective until December 1, 1914. The basic tax rates were exactly the same as in the Spanish-American War period. For proprietary items the basic rate was 5/8¢ for a retail price of 25¢ or fraction thereof. There was a concession for retail prices below 25¢; the rate in this case was 1/8¢ for a retail price of 5¢ or fraction thereof. For chewing gum the rate was 4¢ for a retail price of $1.00 or fraction thereof. 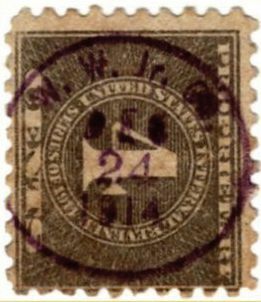 Because of the short time to design, print, and distribute the stamps and a shortage of USIR watermarked paper, the first deliveries of the stamps were on single line USPS watermarked paper, the same paper on which postage stamps were printed. 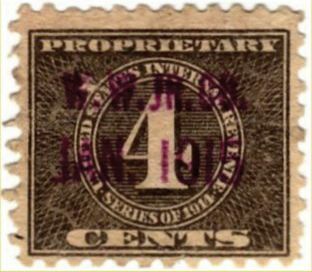 Twelve denominations were printed in black on the postage stamp watermarked paper. As time went on all twelve of these denominations and an additional nine were printed in black on the double line USIR watermarked paper. Several of the additional denominations had no seeming reason for their use: 1/2, 1, 2, 3, and 6 cents. Curiously, we will have reason to look at some known uses of both the 2 and 6 cent stamps on chewing gum. So let’s jump in to the chewing gum manufacturers’ cancels on the 1914 black proprietary stamps. One of the most famous was the William Wrigley, Jr. Company of Chicago. The company was formed in 1893 and marketed Juicy Fruit and Spearmint gums; Doublemint was introduced in 1914. To date the company’s cancels have been recorded only on the 4 cent denomination. There is a very simple circular handstamp with dates in either November or December, 1914 (Figure 1). It has been speculated that these were used exclusively on the company’s inventory on hand when the tax came into effect and during the first month of the new tax. 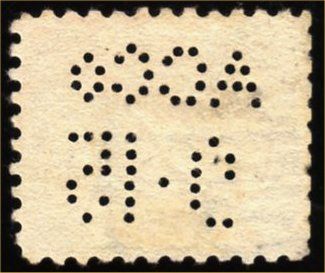 Beginning in January, 1915 a two line handstamp (Figure 2) came into use and it remained in use until the tax was discontinued in September, 1916. So these stamps were in use for a mere 22 months. Wrigley also used two styles of dated perfins (Figure 3). The first style has been recorded for the period February through May, 1915. The second style is recorded for the period July, 1915 through April, 1916. The Perfins Club is still in its infancy of documenting the use of perfins on revenue stamps, but both the Wrigley perfins are listed in Section J, Proprietary of the newly published U. S. Revs - Perfins, edited by Arthur J. Mongan. This useful reference work is available from The Perfin Club. Perfins remain a relatively obscure field on the revenues because of the long standing prejudice against perfin copies. For most the collecting preference, no doubt inherited from postage stamp collecting days, is for uncut examples in our albums. Beech-Nut Packing Company of Canjoharie, New York added chewing gum to its line of products in 1911. Most frequently encountered is a two-line printed cancel Figure 4) and dated monthly. They are found only on the 4¢ denomination. One can chase after all the months from December, 1914 through August, 1916, a chase that appeals to many collectors who frequent stamp bourses. Beech-Nut also used a similar handstamp cancel (Figure 5) that is usually found in purple during the early period and green during the final months. Some patient searching may turn up some handstamps on the 4¢ denomination from the Sterling Gum Company (Figure 6), the maker of Dentyne that became part of American Chicle in 1916, quite possibly after the tax on chewing gum was eliminated. This conclusion comes from recorded dates of the cancel as late as July 11, 1916. 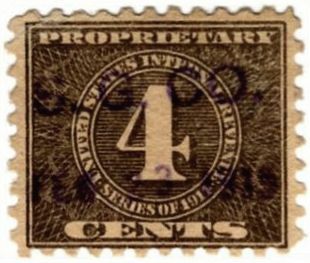 Several other handstamps exist that have been seen only on the 4¢ denomination, an almost certain clue that they originated with a chewing gum manufacturer. M. G. Co., C. S. G. Co., J. Mfg. Co., and T. T. G. Co all have eluded positive identification. Perhaps some reader of this column will enlighten us as to their identity. By far the most frequently encountered printed cancel emanating from a chewing gum manufacturer was applied by the American Chicle Company, founded in 1899 as a result of a merger of Yucatan Gum, Adams Gum, Beeman’s Gum, Kis-Me Gum, and S. T. Britten. American Chicle also added Sen-Sen Chiclets in 1914 and Dentyne (from Sterling Gum Company) in 1916. The company was headquartered in Long Island City, New York. From December, 1914 until January, 1916, American Chicle used a two-line printed cancel with month, day, and year in the second line. After that, the second line includes only month and year (Figure 7). Once again, some collectors chase after all the known dates, a pursuit that will keep a collector busy for years to come. Unlike all the other chewing gum manufacturers, the American Chicle Company printed cancels are found on several different denominations. The 5¢ denomination has been recorded as early as December 1, 1914, the day that the tax became effective. The tax rate of 4¢ per $1.00 retail or fraction thereof means that only the 4¢ or multiples thereof (8¢) should be seen. Nevertheless, the 5¢ denomination was used almost every month by American Chicle. A satisfactory explanation has eluded us. Even more curious is the printed cancel for July, 1916 (the last recorded date for American Chicle), which has been recorded on the 1/8, 2, 4, 5, 6, and 8 cent stamps. Why should this cancel exist on the 1/8, 2, and 6 cent stamps? Perhaps a shortage of the 8 cent stamps could be explained with the use of the 2 and 6 cent stamps in combination. 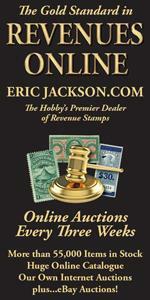 But again the use of the 5¢ stamps defies the logic of the rates in the law and regulation. Even more puzzling is the presence of the cancel on the 1/8¢ stamp. 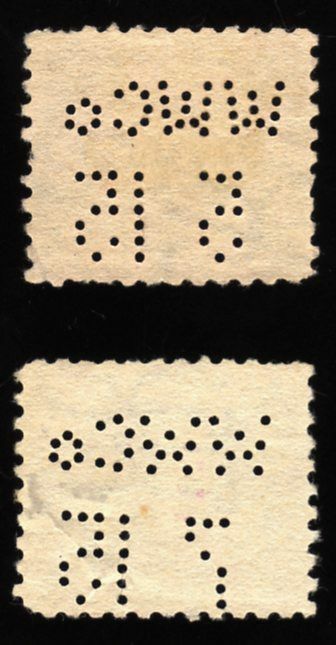 American Chicle also used several styles of handstamp that are thought to have been used in some of its distribution centers in Newark, New Jersey, Cleveland, Chicago, Kansas City, and San Francisco. The location in which each of the handstamps were used remains unknown. Like Wrigley, American Chicle also used a dated perfin. The range of dates spans most of the period of the tax (the earliest recorded is January 1915 and the latest March 1916) and perhaps was used in one of the distribution centers, although this conclusion must be considered speculative. One of the persisting mysteries of these cancels is why only the American Chicle Company cancels are found on the 1/8, 2, 5, and 6 cent denominations. 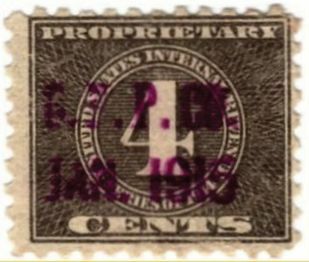 Scott Troutman, who authored The Black Proprietary Stamps of 1914-1916, available from the American Revenue Association, suggested that the 2 cent stamp was used on small packages of gum that retailed for 50 cents. That line of reasoning might also account for the use of the 6 cent stamp (for packages that retailed at $1.50). Nevertheless, this author has found no support for the 2 and 6 cent denominations being used for gum in either the law or regulations. But of course, this still leaves unexplained the use of the 1/8 and 5 cent stamps by a chewing gum manufacturer. Anyone who can produce the regulations that allowed for use of the 1/8, 2, 5, and 6 cent denominations on chewing gum will solve this enduring mystery.